currently have all this end game items except boots. woundering what orbs should i use on each one? also what i should socket in each one? and should i luck them befor or after adding orbs and sockets? Knight's Grace << still needs these boots. if anyone got them ill pay TG! Unfortunately I got a really low roll on the min damage, but the CTC Knife Throw and slows target are nice. It seems better than the Typhaeon RW. I've got all of the basic + easy Uberquests and Rathma Square. To get the K3KBA charm, I used the new map and lured skeletons into the area near the beginning where they'd be out of range of the totems. I killed the two totems on the path to the right corner Necromancer after clearing most of the skeletons around them. I'd either run in and use Phalanx + Barrage on the totem or try to Sun Strike it to death from off-screen. It's an easy path to the Necromancer after clearing those two totems. I started off with Diablo, Cow, Nihlathak, and Tran Athulua (all Dest) runs. I stopped running Diablo once I got the Hanabigami quiver. More recently, I've been running the first part of Yshari Kingdom (found the rare sacred Reflex bow there) and non-boss mobs in the Triune (only got a couple of the +all speed cycles). Destruction Tran Athulua is doable in poor gear. I MO'd all of my armor with the Skeleton reanimates. Always maintain the max number of Fire Elementals. Run forward, shoot some Wyrmshots, and run back a bit if you see the wyrms shooting. If a bunch of your Fire Elementals die at once, you should probably run back because they probably died to Arrowside . Hardest charm so far was probably Jitan, since it took forever for him to drop the charm. I found that summoning him in a corner outside of the building was preferable in case a couple of guards got stuck. It was easier to aggro them out in the open rather than getting stuck in the building. For Judgment Day, I found that it was easier to straight-up kill the avatars while the Fire Elementals tank the Edyrim, and then use the strategy recommended by the guide to draw the Edyrim away and pick up the charm. Try gambling. You might have to refresh a bunch of times, but sooner or later they'll show up . Anyone who has played bowazon extensively since 2017 please fill me in. Is the lack of easy access to pierce very detrimental to the build? How do you compensate for this without using multiple ssssu? Is trying to scale rainbow damage still efficient or should I focus on one element? The nature of how dragonlore works it still seems like it's worth it to focus on rainbow scaling but how? shnurr214 wrote: Anyone who has played bowazon extensively since 2017 please fill me in. Is the lack of easy access to pierce very detrimental to the build? How do you compensate for this without using multiple ssssu? Is trying to scale rainbow damage still efficient or should I focus on one element? The nature of how dragonlore works it still seems like it's worth it to focus on rainbow scaling but how? , Ornate/Fasc/Sacred crafts, etc. There's plenty of ways to do it. shnurr214 wrote: Is the lack of easy access to pierce very detrimental to the build? How do you compensate for this without using multiple ssssu? Is trying to scale rainbow damage still efficient or should I focus on one element? The nature of how dragonlore works it still seems like it's worth it to focus on rainbow scaling but how? You will only face a wall with lack of rainbow dmg vs. necrobots in dfauzt (will need good items to run comfortably). for that blink stun to override the cooldown. For teganze you can just use pots / barrage / phalanx. With barrage you dodge most of the missiles before they hit you if you move after every shot. So it's doable but not fotm by any means. edit: going from FHR 5 to 4 (was being lazy) allowed me to consistently survive jumps without blink, although it's still possible to insta die. Edited by cowking 1 year. 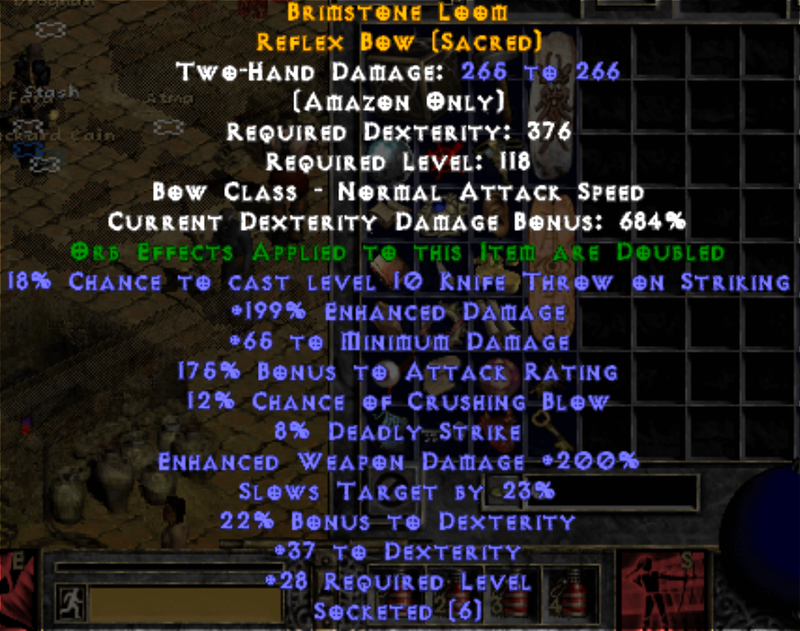 Any other bowazon builds here? Is this one still viable? Please try to understand that i never played MXL, only vanilla. 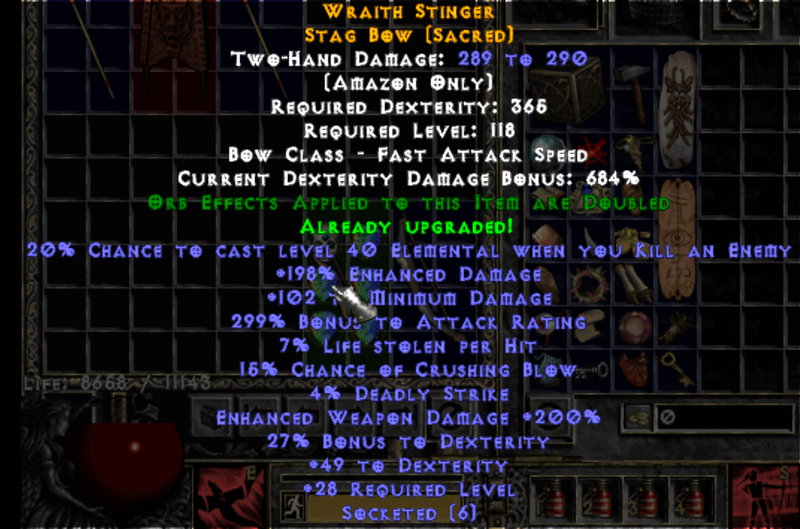 arkolyno wrote: Any other bowazon builds here? Is this one still viable? Please try to understand that i never played MXL, only vanilla. Still viable. Not the best but not many builds could be called the best. It's between pretty squishy and very squishy depending if you use ecstatic frenzy or not. Kill speed is good if you have tri-elemental damage, and this is one of the few builds that naturally has physical, magical, and true-elemental damage built in. Overall though play it if you like bowzons. Play what you like.